Oh balloons. So fun. So cheery. So beloved by everyone. Well, friends, today is the day I officially ruin everything fun, because balloons are really kind of the worst. Why would I come for these cheery birthday staples? And what about when you need to mark a sign? Or have a balloon memorial? Why would I come for the clowns? 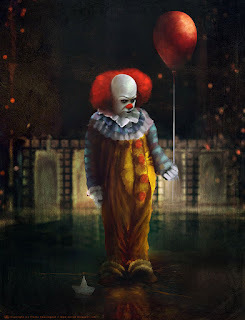 ok, the clown one is obvious. They are already having a profoundly negative effect on wildlife. Balloon releases are especially harmful, but balloons can be mistaken for food or animals can get tangled in the strings. And sky lanterns aren't a great alternative- they can have similar problems and also set basically anything on fire since you have no idea where they will land. Helium is also an issue here, because it is a finite resource. I love good squeaky voice as much as the next person, but we are huffing up a resource that we will run out of. Even worse, balloons are adding to our ever-growing toxic mass of garbage. They are generally single use, come wrapped in plastic, then head straight to the garbage. So just a bunch of insta trash briefly used to make things look festive. It will spend one day as decoration and hundreds of years as toxic garbage. Not great. Want more information about why balloons are the worst? 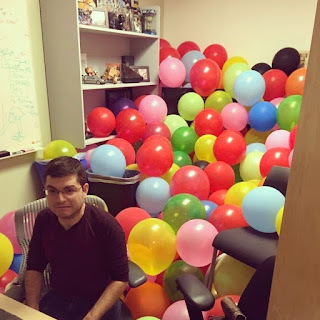 Check out Balloons Blow. You throw a party to celebrate life. If you are a parent, you throw them a party because you want your kid to have a happy life. Balloons may seem like a cheery, easy part of this, but shrinking biodiversity and plastic-polluted waters are going to make their life so much worse, not better. "Cheap, easy, and right now" are the enemies of doing longterm good. I actually think this is wisdom for life- fast food might be cheap, easy, and right now, but enough of it in the longterm and you will be absolutely miserable. The way we act as consumers is exactly the same- throwing a couple of balloons up may be the cheapest and easiest way to decorate your party, but you will do a lot more good for the future if you celebrate another way. So you are throwing a party and still want to decorate? I'm with you! 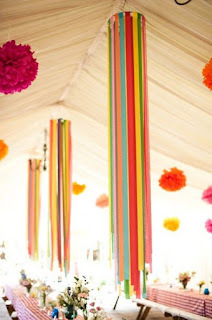 I love a good party theme, and I love decorations even more. Here are five fun, bright decorations to try that are plastic-free and kinder to the environment. You can do so much with Tissue Paper, which is paper so it biodegrades. Also, you can buy this tissue paper that is made of recycled materials. I am a big fan of the tissue paper puff or flower, which you can make with a pipe cleaner and a few sheets and you still get the bright round pop of color. 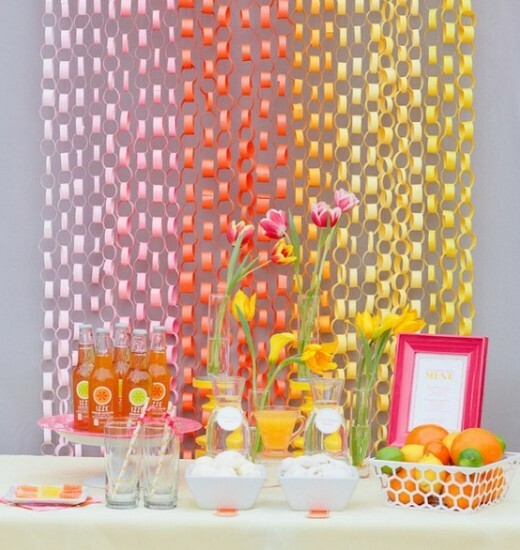 If tissue paper flowers aren't your thing (or don't fit your party), you can find cool tissue paper garland DIY's as well. This seems like a sad material, like kind of tired out and old-fashioned, and you can't do that much that packs a lot of visual punch. But come on- look at these crepe paper chandeliers! These are so freaking cool and I am totally using this idea someday (this link also has a cool version using ribbon instead). The downside is that I can't find any recycled crepe paper, but they still won't be found in the belly of a dead whale. These changed my mind, but I have seen all sorts of cool ideas in crepe paper- I love this rainbow and this crepe paper ceiling too. A Girl and A Glue Gun has a pretty great round up of crepe paper ideas. from Pinterest. Perhaps too much? 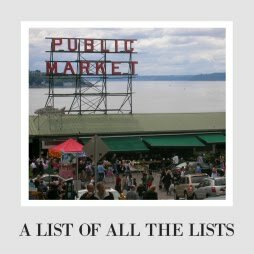 Looking for something more original? 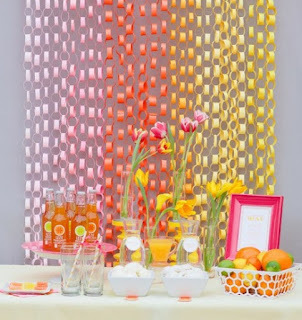 Check out this rainbow paper fan garland, which is super bright and fun. With a little bit of creativity and humor, you can make a banner of almost anything. 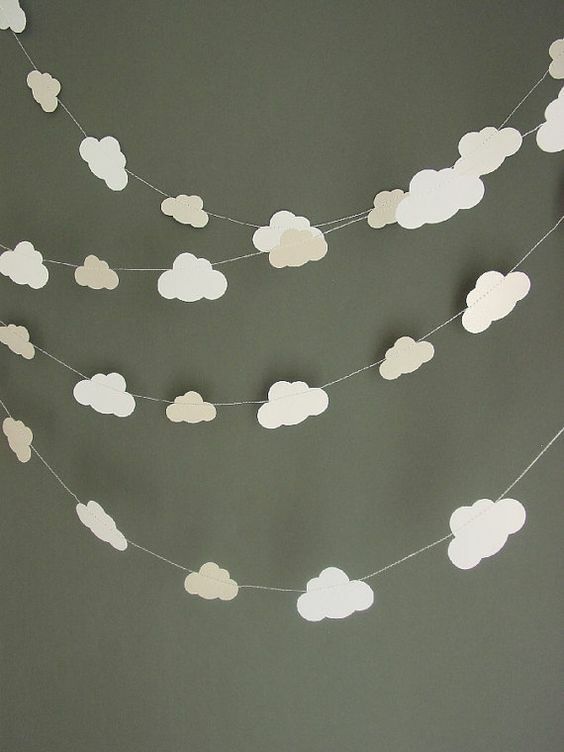 This might be a fun way to bring in your theme, and you could do a few little ones to fill blank space on the wall. These are two of my most recent ones- the trolleys were for a Daniel Tiger party, and the other was for a Harry Potter party. They are both just cut out of construction paper I already had, tied together with string I already had, and cost me a whopping 0 dollars. They also only took an hour or two to make (while watching TV). 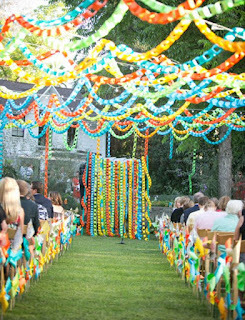 You can find banner ideas for almost any theme you can imagine, but here is some inspiration- legos, cacti, tassels, and yarn poofs. 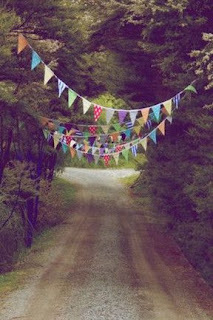 Another option would be to make bunting with bright colors but no particular theme that you can use over and over again through the years. It means you put the work in once, and you can keep reusing it so that you are saving money and time. I love this one from Home Life. And we reuse Christmas, Hanakkuh, and other holiday decorations- why not birthday ones? 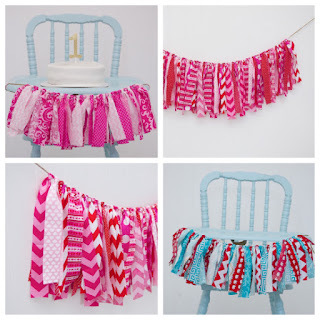 This is the one I am trying right now for the Bear's first birthday party. I bought the used fabric scraps at a secondhand art supply store. 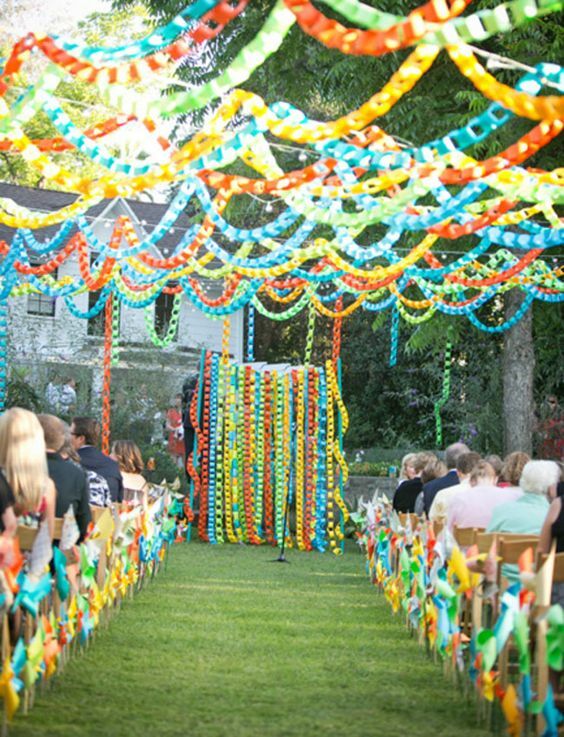 It cost me less than 5 dollars for a huge garland. You could also ask around to family members who quilt or sew (they probably have pieces they keep just in case) or even ask on Buy Nothing. I bet you would get all sorts of fabrics! Definitely an opportunity to spin some garbage into gold. 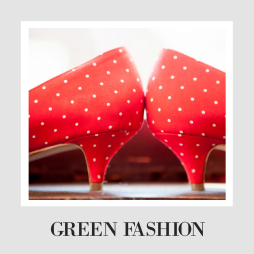 You could also reuse these again and again (and they don't take actual sewing skills). I am using this DIY tutorial from modelbehaviors. So simple and I think it will turn out great! I love so many of these and can't wait to try them myself! What about the balloon release? So, the rest of these ideas pretty well cover the chipper party, but I know that balloon releases have become a very popular way to remember loved ones. Throwing a tissue paper puff won't have the same impact as releasing a balloon. Honestly, I get why these might seem moving, like you are sending a gift off to heaven for your missing loved one. But we know those balloons come down somewhere. And when they do, they make a little more mess in an already messy world. It almost becomes a practice of "out of sight, out of mind"- if we can't see the mess it's not our problem. That's no way to remember someone. My advice, forever and ever, to do instead? Plant a tree. Plant 10 trees. Come back every year to your spot to remember until you have a forest in their honor. I think it is a beautiful way to remember and see time pass. It makes the world here a little bit better in their honor. I know for myself, I would like the world to be even the teeniest tiniest bit better because I have been here. I think it's incredibly moving to imagine even just your memory could do some good. Find a spot that needs the love, and plant something beautiful. I promise your loved one will feel it just the same. So, balloons. This is the end of the road for us. Yes, we have had good times, but thing started going south a while ago, and we are just done now. I encourage you in joining me in just skipping this rather nasty tradition, and we can all come up with our own decorations instead. 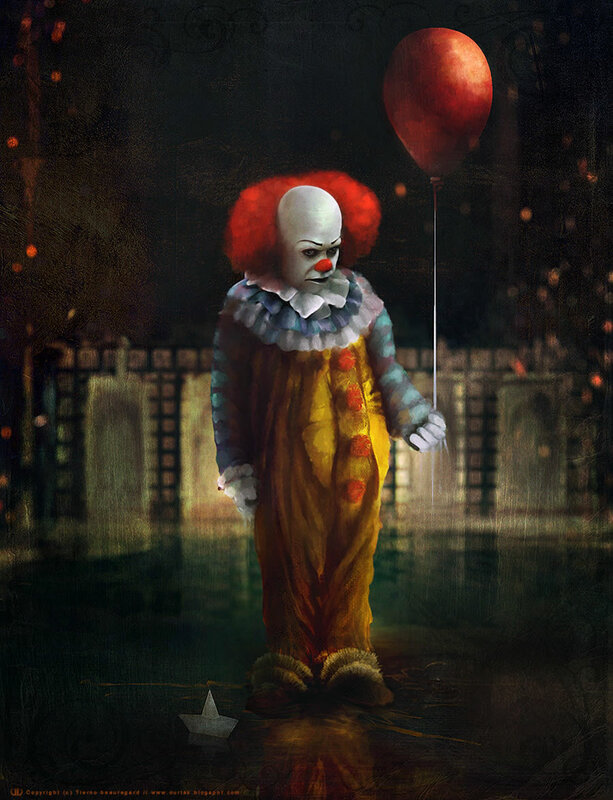 Leave balloons to those creepy clowns. Those tissue paper puffs actually look really effective! I hate balloons and never buy them for the birthday parties I throw. Very interesting learn about the effects balloons have on our environment! I love the alternatives! I use many of these to decorate! I never knew that we were harming the environment so much while happily playing with balloons. 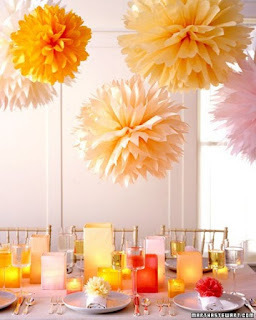 The ideas you gave are pretty especially the puff flowers out of tissue paper look awesome and different.